Since the advent of “talking pictures,” movie music is usually preserved on the films themselves, and can still be readily experienced in screenings and via DVDs and the Internet. On the other hand, the authentic soundscape of the so-called “silent era” is hardly available at all. Yet the amazing fact is that the nearly the entire “language” of film music as we know it developed during the silent film era; there was — and still exists in the form of written scores — a vast and beautiful repertoire of film music created by talented composers during the 1910s and ’20s. But until now, virtually none of this important and fascinating music has been available on recordings. Into this surprising historical void comes this album, curated and conducted by Rick Benjamin, which presents for the first time the original scores of America’s pioneer film composers, including William Axt, Maurice Baron, Irénée Bergé, Gaston Borch, M.L. Lake, Erno Rapée, Hugo Riesenfeld, Victor L. Schertzinger, J.S. Zamecnik, and 8 others. 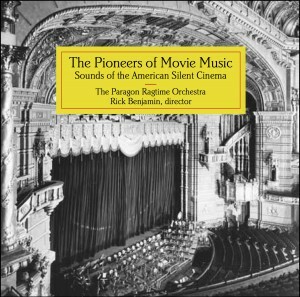 This album also includes a fascinating 52-page historical booklet by Mr. Benjamin exploring the world of silent film music: the widespread use of cinema orchestras, the methods for scoring (“setting”) the films (“photoplays”), period performance techniques, and the influence of brilliant music loving exhibitors like the great Roxy (Samuel L. Rothafel). Detailed biographies of the composers are also included, most for the first time anywhere. The rare original film orchestrations recorded have been selected from the Capitol Theater’s 1,000–title collection of c. 1912 to 1928 cinema scores, played by one of the world’s leading silent film accompanists — the Paragon (Ragtime) Orchestra, conducted by the last of the true movie palace maestros - Rick Benjamin. Produced by multi-Grammy Award winning “Classical Producer of the Year” Judith Sherman, THE PIONEERS OF MOVIE MUSIC is a spectacular salute to the men and music that have added so much of the magic to the silver screen.